Research in the Hauber lab (@cowbirdlab on Twitter) in the Department of Evolution, Ecology, and Behavior at the School of Integrative Biology of the University of Illinois, Urbana-Champaign, focuses on the evolution of recognition systems. Shifting gears between behavioral, developmental, physiological, and molecular tools, we are studying the social and genetic consequences of species recognition in avian brood parasites, such as cuckoos, cowbirds, and whydahs, and their hosts. Obligate brood parasitism in birds provides an exciting model system for the evolution of social behaviors because, unlike 99% of bird species, they lay their eggs into nests of other species and are reared by foster parents. Several other projects in the lab tap into national and international collaborations throughout the world of birds, including the unique and often endangered sea- and shorebird fauna of New Zealand, as well as mammals, spiders, and other organisms from around the globe. This website is a work in progress, so please check in frequently for news and updates. Here's our update on the Illinois website. Bird embryos can hear!! See our coverage in IFLScience and the link to the paper in Neuroreport. Commenting on the new dinosaur egg color paper for Science Magazine! We planted 420 trees to create future nesting habitat at Phillips Track, Illinois.edu !!! Visiting the Cache River to check up on Swamp Canary (Prothonotary Warbler) nest boxes planted by Matt Louder, with the lab! We got the cover of the Oct. 2018 J Chemical Ecology. So excited about this paper on eggshell pigments from cuckoo and host eggs in Central America! Mikus Abolins-Abols catches the cover of Proc B with our endocrine perspective paper! ​Ian Hay's master's thesis on rolling murre eggs is highlighted in Science and Forbes magazines! Quite a controversy!! Our collaborative work on pigmentary colors (and the lack thereof) in non-parasitic cuckoo eggshells is featured on the cover of J Avian Biology Aug. 2018! 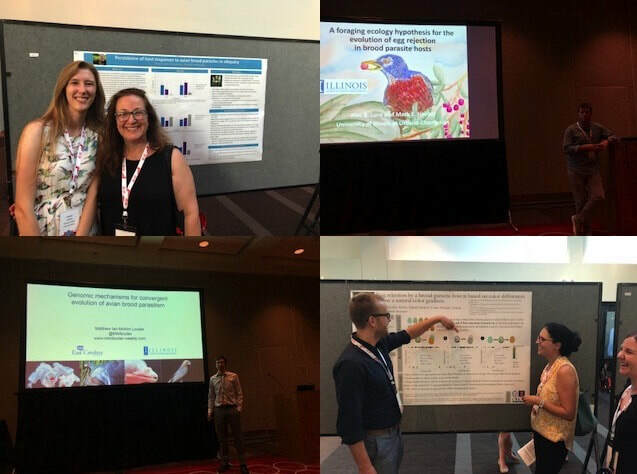 @Cowbirdlab presents posters and talks on our research at #BehavEcol2018 @ISBE2018!! Russian cuckoos strike again! Highlight from Audubon magazine. Two new PhD students recruited for Fall 2018: welcome to Hannah Scharf and Nick Antonson! ​Congrats to Ian Hays! Successful defense of his Master's thesis on rolling murre eggs! Whydahs in Florida! Dr. Hauber comments on the potential impacts in the Miami Herald. A great big welcome to Dr. Mikus Abolins-Abols to the Lab!! Together with new PhD student Shelby Lawson, the lab is now growing at Illinois! Mark Hauber becomes a Research Associate in Ornithology at the American Museum of Natural History! Dr. Hauber collaborates to publish "The biology of color" in Science! 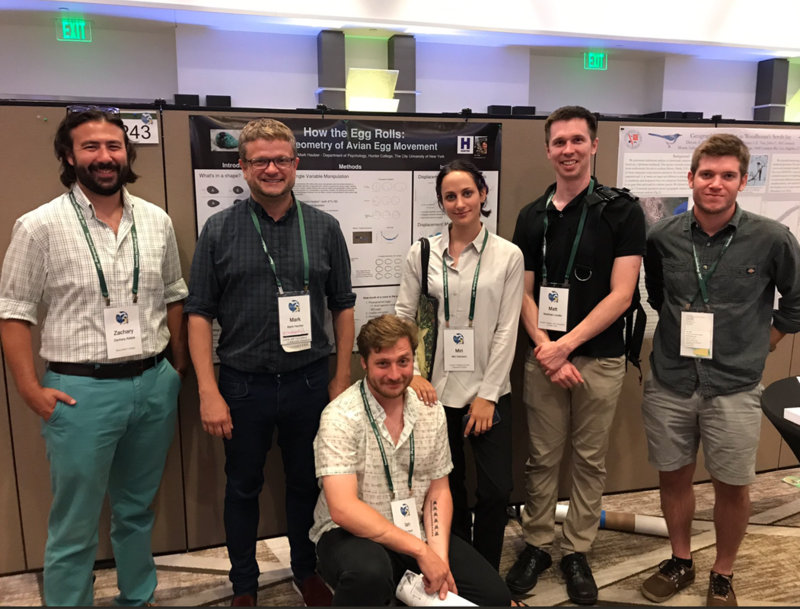 The Hauber lab (current and former members) attends the first ever American Ornithological Society conference! Mark Hauber is interviewed by the NY Times about latest research on whydahs! ​Dr. Hauber is interviewed by The Pulse at WHYY Philadelphia. New paper on House Sparrows by Tommy Manna et al. also lands on the cover, in J Avian Biology! PhD student Alec Luro and research tech Miri Dainson hard at work Jazz Spectrogramming birds at the AMNH ! Congrats to Tommy Manna for publishing a timely review of all things brood parasitic--amongst insects! Here's the link to the paper. Here's Tommy presenting his thesis work at SICB!! Dr Hauber is quoted in the Washington Post on new zebra finch embryonic research published in Science magazine. Prof. Mark E. Hauber, Ph.D, D.Sc.